After Id reviewed Audioengines A2 multimedia speakers in July 2008, they were named GoodSound!s Product of the Year for that year, and Ive lived happily with them ever since. Audioengine packed fabulous nearfield sound into the A2s dinky cabinet, and crammed a 15Wx2 amplifier into one of em in the bargain -- no mean engineering feat. Their stunning fidelity and transparency makes listening to Radio Paradise over my Mac Mini sheer rhapsodic joy. Well, OK, maybe a tad short of absolute bliss -- but the A2s are really, really good. When my editor suggested I take on a pair of Audioengines P4 speakers, I thought, "If Audioengine could cram that kind of wallop into those little powered speakers, imagine what they could do without having to create space for an amp." The P4 ($249 USD per pair) is what weve come to expect from Audioengine: petite. A 0.75" silk-dome tweeter and a 4" Kevlar-cone midrange driver are packed into a front-ported box measuring 9"H x 5.5"W x 6.5"D and weighing but 6 pounds. Significantly, Audioengine has the drivers made to its own specifications, rather than lifting them off another makers shelf. This gives Audioengine the next-best control over product quality -- the best being, of course, making their own drivers. The cabinets are made of sturdy, 0.75"-thick MDF and finished in Satin Black (my review pair) or Hi-Gloss White -- or, for another $76/pair, a very green, very cool Solid Carbonized Bamboo. A rear receptacle holds two very sturdy five-way, gold-plated binding posts, and two 3/8" threaded inserts for wall mounting. This receptacle is at the top of the rear panel -- an odd configuration, perhaps to facilitate mounted applications. Regardless, the P4s fit and finish are exemplary -- this diminutive speaker is all heft and gravitas. Like its powered brethren, the P4 does not come with a grille. Audioengines website asserts that Kevlar drivers dont need protection, and that may be so. Still, I have reservations about the vulnerability of a silk-dome tweeter in an open office environment -- a concern especially germane to the A2. I auditioned the P4s in two different environments and applications -- first, a modest system in the living room consisting of a Harman/Kardon Festival 60: an all-in-one 35Wpc system with a seven-disc CD changer, which we run with PSB Image 2B speakers (an earlier version of the au courant Image B5). For an intimate space, the Image 2Bs offer pristine clarity and appreciable bass -- a challenge to any wannabe replacement. Unfortunately, midway through the review, the Festival 60 began to have problems playing CDs. So I moved the P4s upstairs to the Man Cave, my dedicated music room, where they were fed by an original Sunfire amplifier, an Audio by Van Alstine Omega Star EC III preamplifier, and a Parasound C/DP 1000 CD player. In both systems I use Kimber Kable 4VS speaker cables terminated with banana plugs. Loudspeakers may devour power by the megawatt, but most power amplifiers use only a tiny fraction of their output at any given time. The 35Wpc Festival 60 played as loudly as we could want, either in the living room or in the adjacent dining room. The Image 2Bs have a 1" dome tweeter and a 6" midrange driver. Their gifts are gobs of midbass, a whistle-clean midrange, and an uncluttered treble. After Id broken in the Audioengines with blasts of out-of-phase pink noise, into the downstairs system they went. Shock and awe? Not exactly, but the P4s proved able replacements for the PSB Image 2Bs in the critical aspect of reproducing the music we expected to hear with little or no coloration, distortion, or any artifact that compromised the fidelity of the sound. Moving the P4s up to the Man Cave changed only their environment, not their performance. OK, there were qualifiers. First, while the midbass was rendered with sumptuous generosity, it wasnt always as deeply reverberant as one might want. For example, on the title track of Marti Joness Any Kind of Lie (CD, RCA 2040-2-R), the menacing growl of Don Dixons double bass, as his bow slowly scrapes back and forth, lost only a little depth through the P4s. Deep bass, however, was MIA. The subterranean synth bass in "Orinoco Flow," from Enyas Watermark (CD, Reprise 26774-2), stayed politely on the musics surface -- the 30Hz note that concludes the bridge simply disappeared. That said, for nearfield listening I found the P4s midbass accurate, complementary, and pretty much lacking any of the artifacts -- standing waves, boominess, and so on -- routinely associated with deep-bass reproduction. This was true, albeit light, bass. Then again, any appreciable bass from a speaker this teensy is a huge plus. Second, the P4 got the midrange right. We audio reviewers have field days with speakers that either shriek up the treble or poop out on bass. Theres no such thing as the perfect speaker, so one can have a great time heaping hefty loads of critical verbiage atop whatever compromises the designer had to make to bring his baby in either within budget or within the range of human hearing. However, for any designer, achieving midrange accuracy is noteworthy, regardless of where the extreme treble and bass roost, and the P4s delivered the midrange in heaping, steaming platefuls of aural satisfaction. This was especially apparent with well-recorded acoustic music. Vienna Tengs Dreaming Through the Noise (CD, Zoe 01143-1091-2) is mostly recorded with a shifting acoustic ensemble. Tengs voice (more on this below) on this recording is prominent by subtraction: she rarely breaks a soft whisper. The accompaniment, therefore, must be just as quiet, as much a challenge for the recording engineer as for the players. On "Transcontinental, 1:30 a.m.," Till Bronner breathes his trumpet solo with effortless intimacy, as subdued and restrained as if playing tableside in a dark caf�. So immediate was the sound through the P4s that I felt as if I could hear his breath course through the valves. Similarly, Dina Maccabbees viola solo in "Blue Caravan" resonated so deeply that I imagined I could hear the notes developing in the body cavity before emerging bathed in wood and varnish. Stan Getzs classic tenor-sax solo on "The Girl from Ipanema," from Getz/Gilberto (CD, Mobile Fidelity Sound Lab UCDC 607), with its infectious swing and breathless intensity, soared from the P4s with astonishing presence. Perhaps the acid test for any speaker is the female voice, and here the P4s etched an enviable pattern of uncolored accuracy. Vienna Tengs diction in "Blue Caravan" approaches Ella Fitzgeralds in crisp, crystalline precision -- dentals pop and explode, labials roll with gleeful abandon. Similarly, Enyas superb vocal on "Evening Falls," also from Watermark, streamed naturally, with no hint of chestiness or sibilance. Having the P4s around would be excuse enough to haul out your collection of Sarah Vaughn, Dinah Washington, and Aretha Franklin records, to luxuriate in the honesty and depth of their singing. Stereo effects were rendered with remarkable fidelity. Stereo imaging, as one would expect with any modern speaker, was rock solid. Out-of-phase information spread admirably beyond the speakers, and soundstaging was equally impressive. In "Canned Music," from Dan Hicks and His Hot Licks Striking It Rich! (CD, MCA MCAD-31187), Hickss voice was dead center, with Naomi Ruth Eisenbergs to the left and Maryann Prices to the right -- none wavered a skosh, a paragon of how ensemble vocals can occupy discrete spaces yet seamlessly mesh. The percussion bridge in Acoustic Alchemys "Mr. Chow," from Red Dust & Spanish Lace (CD, MCA MCAD-5816), floated high above the speakers -- exactly where it should. If I have any quibble, it was that the soundstage depth was fairly shallow -- neither the Hicks nor Acoustic Alchemy recordings, despite the dead-on placement of voices and instruments, achieved the spatial depth that Ive heard from them through admittedly more expensive speakers. Finally, one might expect small speakers, with their necessary focus on the midrange and treble, to not quite fade into the background. Not so the P4s -- commensurate with their able stereo imaging and handling of out-of-phase information, the P4s achieved a level of transparency Ive heard only in very expensive speakers of this size. They didnt virtually "disappear," but what I heard was music, with scant evidence that the amazing phalanx of sound was emanating from two rather small black boxes. The placements of the voices in "Canned Music" were testament to their soundstaging and lack of directionality. Yes, Eisenbergs and Prices voices were to the left and right, respectively, but Eisenbergs was placed slightly outside the left speaker, Prices slightly outside the right. Lesser speakers have collapsed that distance, placing both singers between them. With more recent recordings (alert readers will recognize the graying pedigree of my time-honored reference recordings), such as Koops Koop Islands (CD, Atlantic 237052-2), Tengs Dreaming Through the Noise, and Snow Patrols A Hundred Million Suns (CD, Geffen B0012156-02), the sound was more fully realized, with depth and cohesion. This may or may not be attributable to modern engineering practices, which tend to compress and limit recordings as much as possible. Regardless, when I played these recordings, there was no doubt that these diminutive wonders could fill a room with sound. 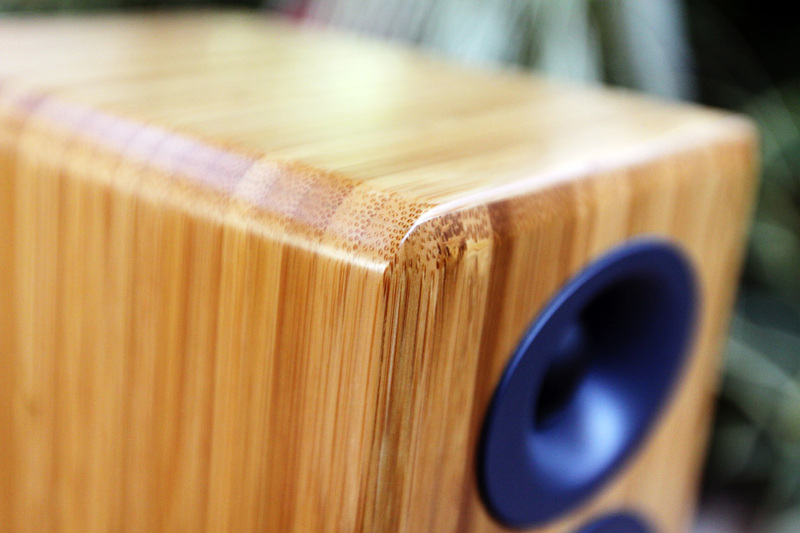 See our Audioengine P4 photo gallery featuring the Carbonized Solid Bamboo finish. A year ago, I reviewed the TEAC DR-H300 DVD receiver for our companion site Home Theater & Sound. Its a $400 combo of two-channel receiver (with subwoofer out) and DVD player that delivers a marvel of audio and video options, and is designed for small spaces. I suggested that, mated to the right bookshelf speaker, it would be perfect for the proverbial dorm room. Well, here it is: The Audioengine P4 is the perfect bookshelf speaker for space-challenged environments. With the right recording, it will fill a substantial room with crystal-clear sound -- but in a small room where nearfield listening is more the rule than the exception, the P4s are impressive. Ive suggested above that theyre somewhat bass-shy, and there is where the beauty of mating them with the DR-H300 comes in: Just connect a small subwoofer to the DR-H300s subwoofer output and youll have the full spectrum of luscious, inviting, uncompromised sound -- one that will fit into a small space and will make that small space feel as if its a lot bigger. Ill go out on a limb here: Audioengine has found a unique, and perhaps a preferred, method for developing a speaker line. In an effort to bring new life, not to mention fidelity, to new methods of listening to music, they began with powered computer speakers, the A2 and somewhat larger A5, and a subwoofer, the AS8. For instance, the A2s input will accommodate an iPod just as easily as it will a PC input. Having cut their teeth on wrenching excellent sound from compromised enclosures -- several of their speaker models contain an amplifier -- theyve simply removed the amp and built a traditional unpowered -- OK, passive -- speaker, and kicked off their next generation of small, affordable products, which have sound that is simply astounding. As I conclude this review, Im listening to Elliott Smiths sublime XO (CD, DreamWorks SRMD-50048). Like the newer recordings cited above, its filling the room with clear, uncompromised, unfettered sound. Is the sound of the P4s as deeply realized as that of the PSB Image 2Bs? No -- but considering their size and driver complement, the P4s come pretty darn close. Attentive readers will know that Im a big fan of big surprises, and big sound from small boxes. 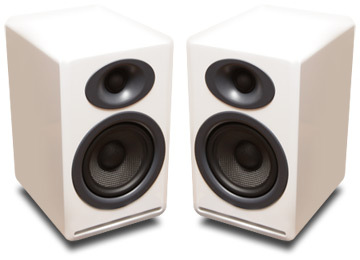 Like the A2, the P4 is a great speaker and an incredible value. Youre going to have to spend a lot more -- a whole lot more -- to achieve the measures of sound quality and packaging convenience afforded by the Audioengine P4. Price: $249 USD per pair in Satin Black or Hi-Gloss White, $325 per pair in Carbonized Solid Bamboo.